Edmund Purdom, best known for his roles in two 1954 productions, the musical The Student Prince and the period epic The Egyptian, died in Rome on Jan. 1. He was 84. 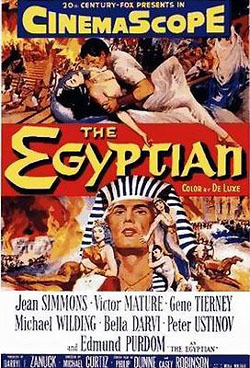 Based on Mika Waltari's bestseller, The Egyptian was to have been a major Marlon Brando vehicle, but the actor withdrew from the project. (According to Henry Koster, Brando clashed with director Michael Curtiz.) Brando was then slapped with a seven-figure lawsuit courtesy of 20th Century Fox, while Purdom, who had a small role in Brando's Julius Caesar (1953), landed the part of the physician Sinuhe of Ancient Egypt. 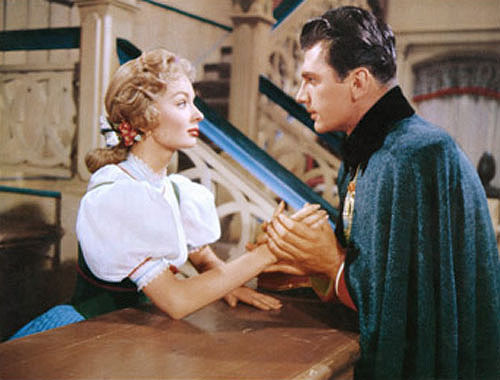 Purdom's two 1955 efforts, the period dramas The Prodigal, with Lana Turner, and The King's Thief, once again reunited with Ann Blyth, proved to be box office disappointments. By the late 1950s, Purdom was playing in European period dramas such as Herod the Great (1959), in the title role, and Les Nuits de Raspoutine / The Night They Killed Rasputin (1960), in which he incarnates the mad monk. In addition to starring in loads of low-budget productions during his five decades in Europe, Purdom also did dubbing and voice-over work. Edmund Purdom was my crush when I was 14yrs old. After 2 husbands and 7 children and no computer during those years, I got lost in the hustle and bustle of daily life. Now, at 79, all alone and with a laptop but not so well adept with it, all I do is google him and read the same stories over and over again. I just regret there is only one good photo that shows him in his not-so-old-age, but I still love it. I also play the Student Prince and his other films over and over again. I was happy that Linda Christian loved him. For me, he will be my “Student Prince” forever in my heart. In 1994 I had the privelege of “directing” Edmund in Rome in a reading of Joyce's “Dubliners” for a major Italian educational publishers, as well as co-ordinating a dramatised version of Shaw's “Pygmalion” with him and other distinguished English-language voice-over artists resident in Rome. Staying at his flat, where his numerous cats kept me company overnight, was a fascinating and inspiring experience, as he entertained me and other guests with stories from his colourful life. And he had a wonderfully simple voicemail greeting: “Purdom - ROME!” Unforgettable.